The Next Generation of Davenport 5-Spindle Screw Machines is here. The Davenport Hybrid Machine is a combination of the most progressive and exciting technologies we've developed for our customers over the past few years. Offering a blend of Davenport's coveted mechanical versatility and CNC-level accuracy, the Hybrid Machine is your answer to increased profits and capacity. Can it Make Parts More Accurately? Will I still need a shave tool? 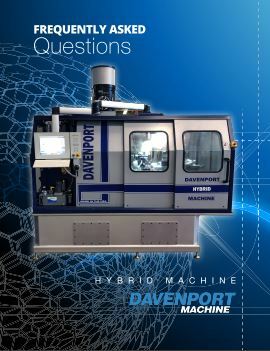 Is the Davenport Hybrid Machine any faster? Do the new CNC slides accept my current tooling?